8ft, 11ft, and 15ft replacement custom Feather Flags. Flags are 2 1/2ft wide. 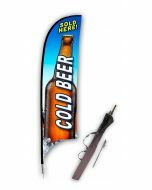 See Feather Flag Kits for flags and hardware.